Map of ETIDContext, indexed by ETID. Safe pointer to an ETIDContext (not thread-safe). Map of PIDContext, indexed by PID. Safe pointer to a PIDContext (not thread-safe). Map of ServiceContext, indexed by service id. Safe pointer to a ServiceContext (not thread-safe). Update the global statistics value if internal data were modified. First system local time (first packet). First STT (ATCS) UTC time stamp. First TDT UTC time stamp. First TOT local time stamp. First system UTC time (first packet). Number of global PID's (ref but no service). Number of packets in global PID's. Number of scrambled global PID's. Number of packets with invalid sync byte (not 0x47). Last system local time (recomputeStatistics). Last STT (ATCS) time stamp. Last TDT UTC time stamp. Last TOT local time stamp. Last system UTC time (recomputeStatistics). Number of PID's with PCR's. Number of PID's (with actual packets). Bitrate for global PSI/SI PID's. Number of global PSI/SI PID's (0x00 to 0x1F). Number of packets in global PSI/SI PID's. Number of scrambled global PSI/SI PID's (normally zero). Description of services, map key: service id.. Number of suspect packets, ignored. Number of packets with transport error. TS bitrate (either from PCR or options). Transport stream id is valid. Average TS bitrate in b/s (eval from PCR). User-specified TS bitrate (if any). Number of packets in unreferenced PID's. Number of scrambled unreferenced PID's. A class which analyzes a complete transport stream. 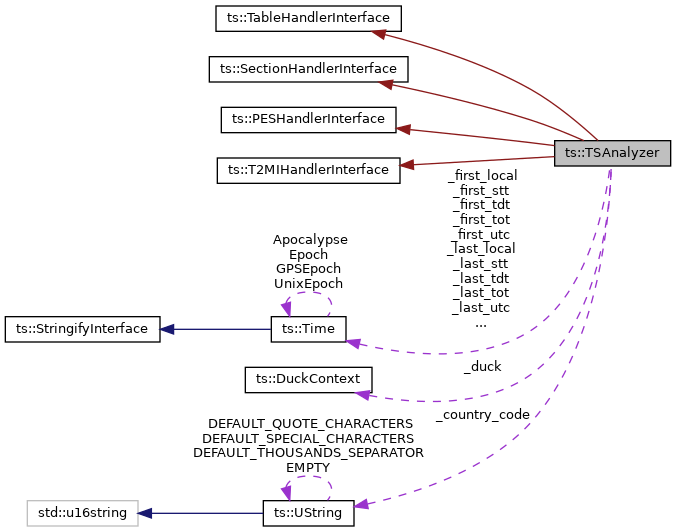 [in,out] duck TSDuck execution context. The reference is kept inside the analyzer. [in] bitrate_hint Optional bitrate "hint" for the analysis. It is the user-specified bitrate in bits/seconds, based on 188-byte packets. The bitrate hint is optional: if specified as zero, the analysis is based on the PCR values. The following method feeds the analyzer with a TS packet. The stream is analyzed by repeatedly calling feedPacket(). [in] packet One TS packet from the stream. Specify a "bitrate hint" for the analysis. Set the number of consecutive packet errors threshold. [in] count The number of consecutive packet errors after which a packet is considered as suspect if it does not belong to a previously known PID. If set to zero, suspect packet detection is disabled. Initially set to the default value 1. Set the maximum number of consecutive suspect packets. [in] count When that number of consecutive suspect packets is reached, the next packet will not be considered for suspect detection. Initially set to the default value 1. Get the list of service ids. [out] list The returned list of service ids. Get the list of all PID's. [out] list The returned list of all PID's. Get the list of global PID's. Global PID's are PID's which do not belong to a service. [out] list The returned list of global PID's. Get the list of unreferenced PID's. [out] list The returned list of unreferenced PID's. Get the list of PID's for one service id. [out] list The returned list of PID's. [in] service_id The service id. Get the list of PID's carrying PES packets. [out] list The returned list of PID's carrying PES packets. Allocate a new entry if service is not found. [in] service_id Service to search. A safe pointer to the service context. Allocate a new entry if the ETID is not found. [in] section A section containing the ETID to search. A safe pointer to the ETID context. Check if a PID context exists. [in] pid PID to search. True if the PID exists, false otherwise. Allocate a new entry if PID not found. [in] description Initial description of the PID if the context is created. A safe pointer to the PID context.